The conditions of the simultaneous preconcentration of Ti(IV), V(V), Mo(VI), and Ni(II) on a double-layer support and their sequential determination using organic reagents are studied by diffuse reflectance spectroscopy. Disks of polyacrylonitrile fiber filled with an anion exchanger (PANV–AV-17) or a cation exchanger (PANV–KU-2) are used as supports. The determination of titanium and nickel on PANV–KU-2 disks is based on the successive interaction of nickel with dimethylglyoxime (DMG) and titanium with 2,7-dichlorochromotropic acid (DCCA). The determination of vanadium and molybdenum on PANV–AV-17 disks is based on the interaction of vanadium with 8-hydroxyquinoline-5-sulfonic acid (HOS) and 0.1 M HCl and molybdenum with phenylfluorone (PF). 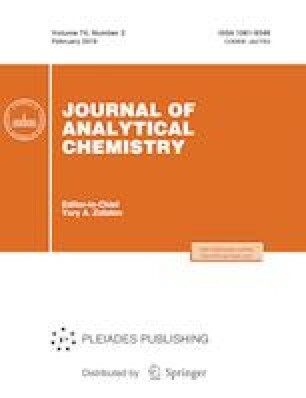 The dependences of the analytical signals of Ti‒DCCA and Ni‒DMG complexes on PANV‒KU-2 and V‒HOS and Mo‒PF complexes on PANV‒AV-17 on the pH of solutions in sorption in the dynamic mode are studied. The optimal pH value of the solutions for the simultaneous sorption of four elements is 3.5 ± 0.1. The influence of accompanying elements in the mixture on the determination of Ti, V, Mo, and Ni is studied. Characteristics of the sorption-spectroscopic determination of elements are given, i.e., the sequence of the treatment of support disks with reagent solutions, the conditions for eliminating the signal of the previous element, the coefficients of calibration equations and the linearity ranges of the calibration curves, and the limits of detection of elements. Selectivity factors are determined and a procedure for the sorption-spectroscopic determination of Ti, V, Mo, and Ni on their simultaneous presence is developed. The results of analysis of model solutions with different ratios of elements are presented; RSD < 15%.